This projects falls under the category of, ‘I never planned on doing this when we bought the house.’ Oh well. After we got water pouring in through our basement window, I decided it was a must-do project. We actually did it the weekend a hurricane was supposed to hit New Jersey. Hubby and I were still outside when it started to rain. But we finished with enough time to head inside, and luckily all the other precautions we took kept the water far from the windows. Let me show you what was on the house when we moved in. Or should I say, next to the house, because, as it turns out, the damn things were never attached to the house. Nope, they were just leaning up against the concrete foundation, and were sinking lower and lower into the ground. WT?? You can’t even see the prefabricated steel window well anymore, it’s a few inches below the dirt. Just to be clear, the purpose of the metal well is to hold the dirt back, it is not meant to hold water back. Water shouldn’t be flowing toward the window, always grade away from the house. Now, the first option would be to lower the earth to 6″ below the window and then slope down and away from there. This was not an option for us. We had already lowered the grade of our soil quit a bit and it needed to be that high against the foundation to keep the proper pitch. On the other hand, you don’t want the soil to be so high as to touch the siding, you must maintain at least a few inches of clearance, otherwise moisture will get stuck under the siding and that’s no good. This is what it looked like when I removed the plastic cover. Can you see the metal semi-circle down there? The new one I bought from Lowe’s was a few inches taller, but could have been more so. But let me tell you, if you’re trying to buy window wells right before a hurricane, it’s going to be slim pickings. I had to wait for an emergency shipment to come just to get these. You could just forget it if you were looking for plastic covers, because there were none to be found! If they had these window wells at the time, I would have bought them instead. Ideally, you want one that is deep enough to extend at least 8 inches below the level of the windowsill and is at least 6 inches wider than the window opening. There is not a lot of technical know how in this project, but drilling into concrete can be a little intimidating. That and getting enough gravel. We have a pickup truck and bought 2 tons of pea gravel to split between 3 windows, which was overkill, but that’s how we roll. You could buy bags of pea gravel from Lowe’s or Home Depot, if you had to, but it would cost more. I guess digging a hole can be a challenge for some people too, but again, not technical. Update: This is the same window 4 years later. Attach the prefabricated well – Carefully mark where you need to drill the holes by positioning the well and making sure it’s level. Drilling into your concrete foundation is not something you want to mess up, so mark the placement of the fasteners carefully. 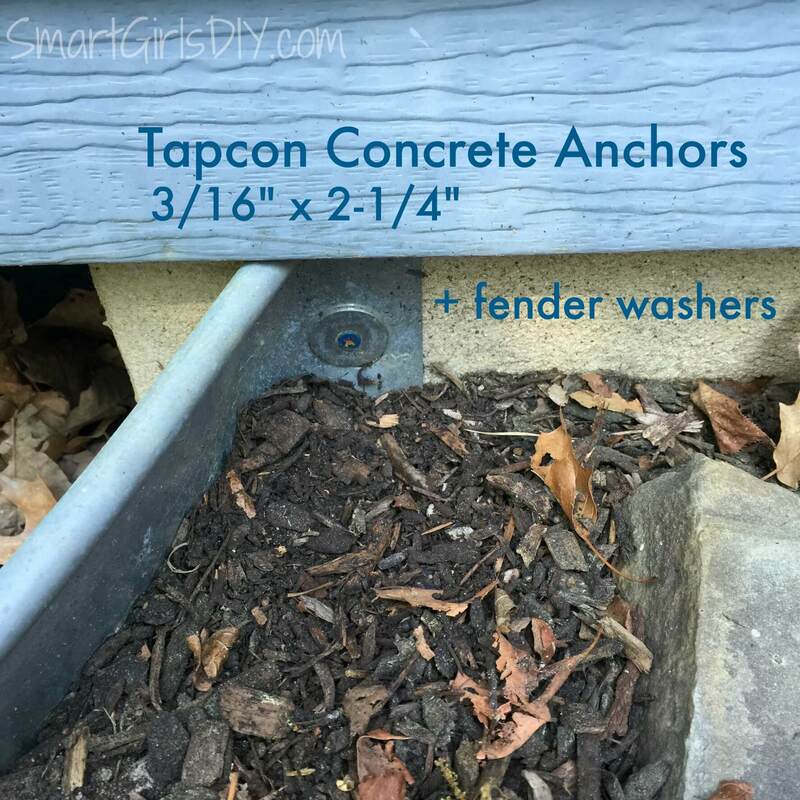 Use a Sharpie to mark the concrete by coloring through the pre-drilled hole on the well. Use a hammer drill to make the holes. Make sure you’re using a bit designed to drill through concrete (a masonry bit). Backfill the hole – Maybe it’s a chick thing, but I like to lay down landscape fabric anytime I’m putting rock on top of dirt. If you skip the fabric, the two will eventually mix together. A lot of guys skip this step, so you can if you want, but I didn’t. Now fill in that hole with pea gravel. Make sure at least the bottom inch or two of the well is covered. Put gravel in the hole and around the perimeter. When you’re done adding gravel, close up the top of the landscape fabric and fill the remaining couple of inches with dirt, making it level with the dirt around it. Try to leave 6″ of the well above ground. Add a well cover – You can see the steel well sticks up above the dirt, and the plastic cover goes around it. I never have any problems with debris or animals getting in there and they’re not even attached. The top part fits under the groove in the siding and it stays put. I used these covers. Here’s another view. Be sure to check out the posts on the lattice storage area, retaining walls, arbor and gate and split-rail fence. Think you’re going to give this a try? Go for it! This cute little guy is optional. Thank you for pictures and explanations! This was a wonderful tutorial! how long did it take you? Hi Jenn! The longest part was digging the holes. Removing the existing window wells took 3 seconds bc they weren’t attached. It took longer to drive over and pick up the gravel then it did to scoop it into the holes. Once we got the right drill out it was pretty quick to screw the new wells on. It was all done in one day, but I’m not sure how many hours total. I’m planning a similiar job myself. Would a regular household drill be up to the task for drilling the concrete holes? Nope, you would be at it all day and break quite a few bits, spend the money and get a hammer drill, if you dont know someone who would lend you one. Thanks, I learnt that the hard way, ended up renting a hammer drill from Home Depot. Job done now. 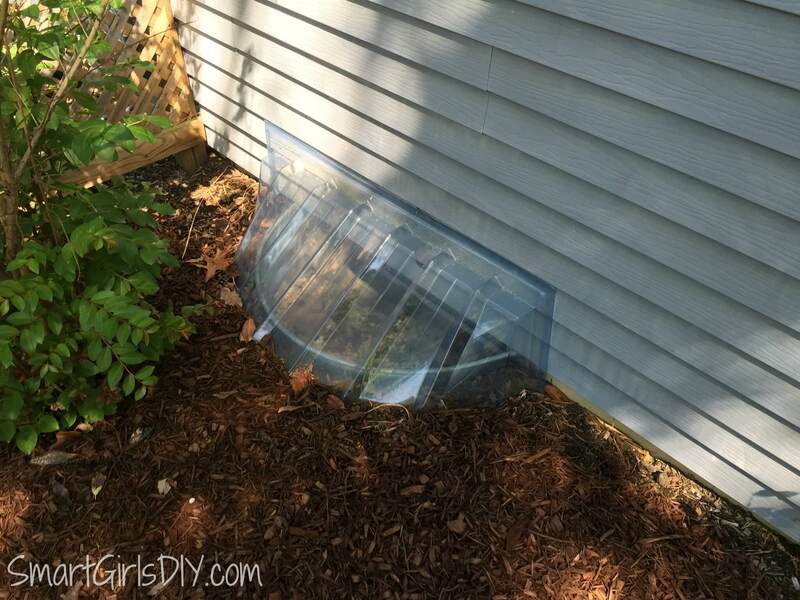 how did you attach the cover on the siding or just bury in the mulch? The top edge of the cover slides under the lip of the siding, but it does not attach. It gets wedged underneath and doesn’t move at all. I made sure the dirt underneath was just the right height and then I covered the bottom edge of the cover with mulch. How high do you go with the pea gravel ? 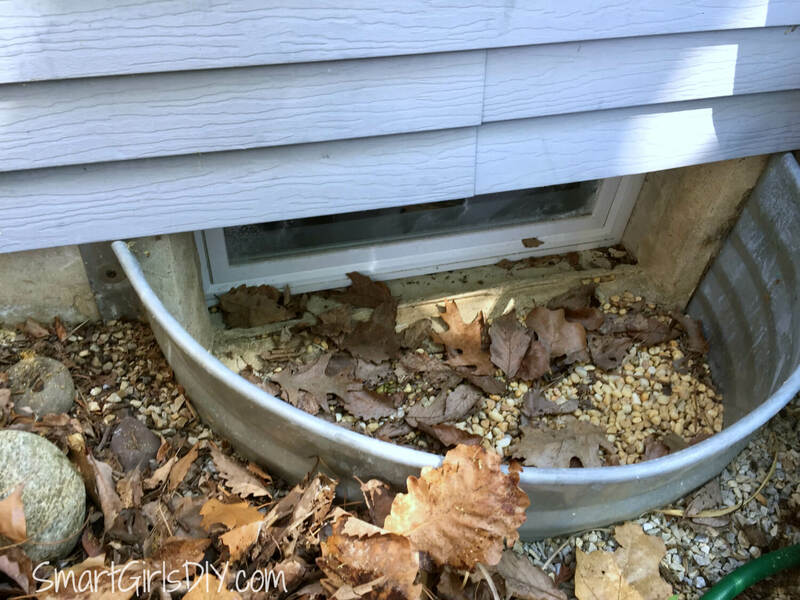 Up to the window sill or leave 6″ below sill ? I have dug down 16″ below window sill and filled with 10″ of pea gravel so far. Thanks. I would NOT go all the way up to the window sill because that is just asking for debris inside your window. I think 6″ would be plenty! i’M like you, where I tear into just about anything. I want to do the same thing on a window that has water running into the basement on a rental property. It looks like this has been going on for years, based on the way it smells in my basement. My question to you is, you were putting the anchors into concrete, and I would be putting them into brick. Does the same hammer drill method apply? Yes same method. Always make sure your anchors (screws) are made for the material you have. Most are good for a variety of masonry including concrete and brick. Good luck! have to purchase a hammer drill and 2, that you did not put in any drainage pvc//pipes. 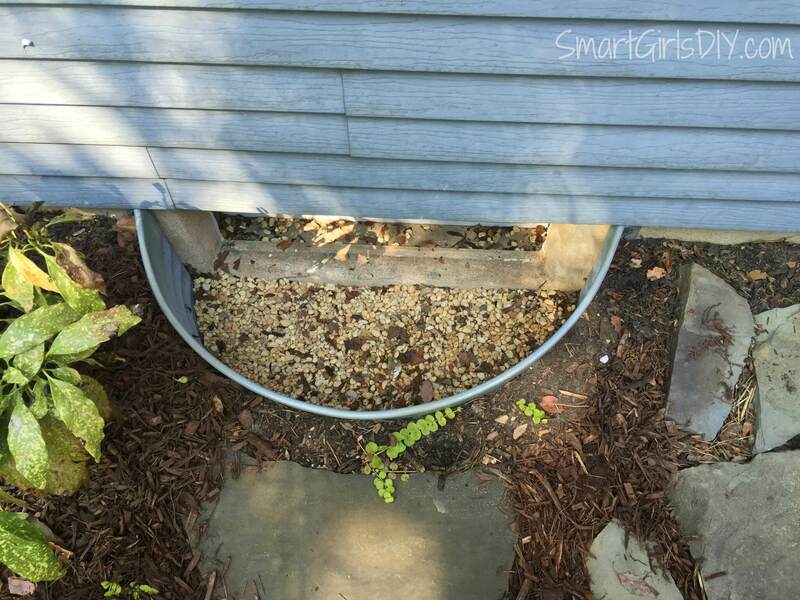 By having the gravel alone, does this suffice to keep the water drained around the inside of the window well? Or, am I missing something and maybe you connected to something underground? Hi Trisha, after reading several article before this one that talked about drains, I wondered too. I hope we both get a reply. I can say that I also read other articles and you tube video that states if the base of stone is thick enough like Smart Girl describes and then the stone inside the actual well also, it is indeed a drain in itself for the water. My father passed 10 years ago but the window wells at his house have stone and have never had a problem. my oldest brother states there is no drain under these. My father was pretty much an expert on all things construction and I wish his 91 years had lasted to his infamaous “102” reply, so I could ask him sooo many things. Good Luck .I start to dig tomorrow . Hi Pat, Please check my response to Trisha and let me know if you have anymore questions. We installed these window wells six years ago and they are as good as the day we installed them. The gravel stays dry, but if it were to get a flood of water, the gravel would keep the water from entering the window. Good luck! The gravel is the drainage. No pipes/PVC are necessary. The point of the window wells is to keep water from entering through the window. IF water were to enter the area in front of the window, it would seep down between the rocks and eventually back into the surrounding soil. 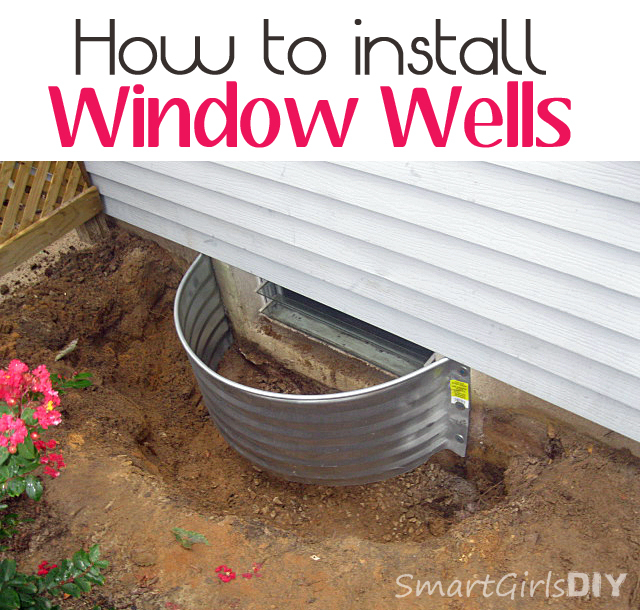 BUT it is extremely unlikely that a large amount of water would ever enter the window well if you’ve done these other steps: 1) sloped the ground AWAY from the window 2) installed a metal retaining well that sits HIGHER than the surrounding soil 3) installed a plastic window well cover. Even when it is pouring rain, very little, if any, rain goes directly into the window well because they are covered with the clear plastic covers. These don’t last forever but they are not expensive and worth replacing every few years. So again, water should not be getting near your window in the first place, but if it does, it will drain down through the gravel instead of entering the window. I hope this helps! Good luck!! I’ve been looking all afternoon and this was by far the best how-to I found. Thanks! Awesome! I’m so glad it helped. I think professionals often overlook easy stuff that isn’t common knowledge for the rest of us.